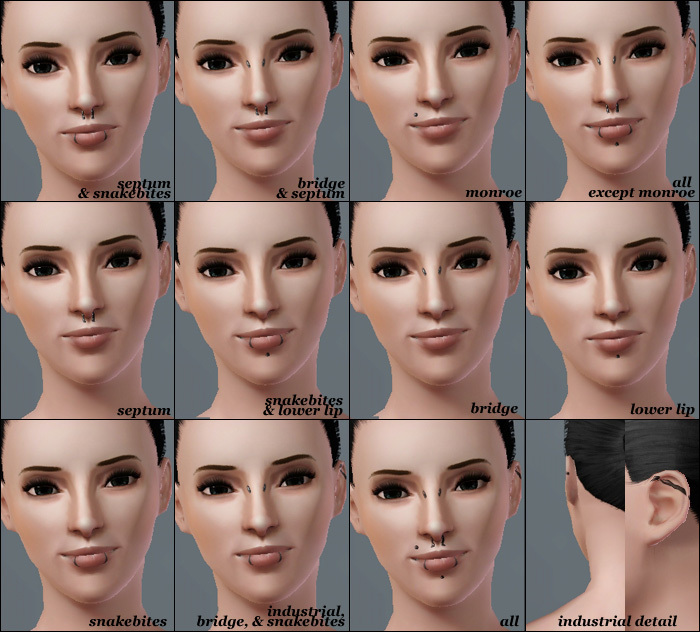 I'm surprised no one has made these already, but I really wanted some facial piercings for my sims so I went ahead and made some myself. At the moment, I don't believe there is a way to layer makeup, so I created both each piercing as it's own mask, and also a few combinations for variety. These are found under costume makeup, and they are recolorable so you can have tinted metals. However, since they are made from a costume makeup, you cannot apply patterns to these. They are made to look like metal, so unless you make them black, they are going to always have that metallic look. 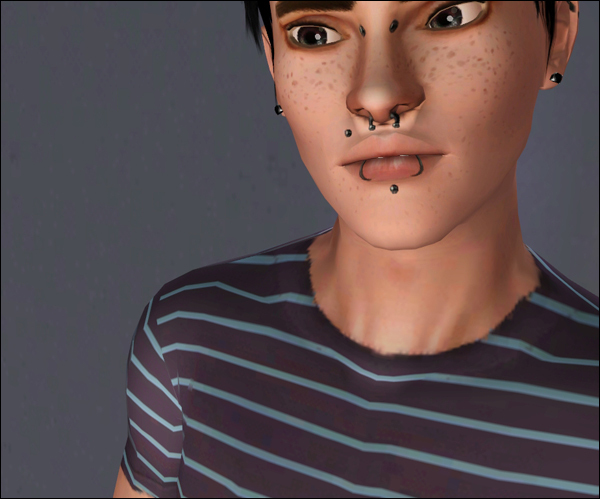 Because they are fitted to the face, if your sim has extreme features, the piercings may stretch and become distorted. This is most noticeable for the bridge piercing on males and females and also for the septum piercing on females. 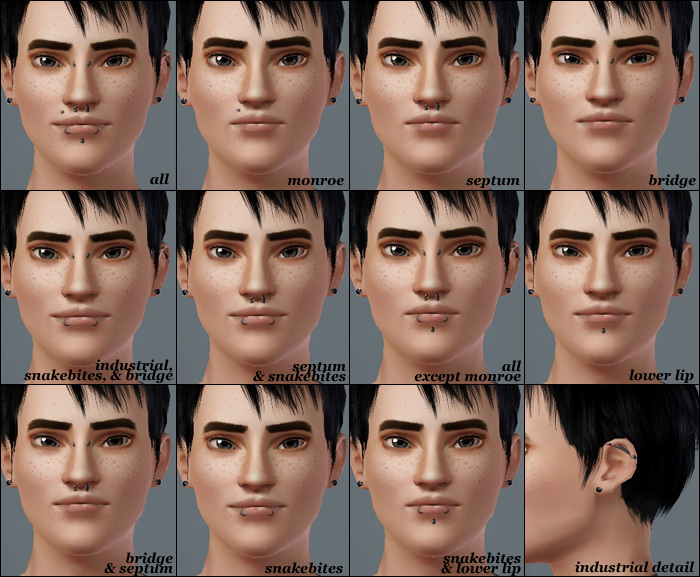 The female piercings are distorted much more easily than the male ones for some reason, I guess female sims have more distinct faces. Also, the industrial piercing on females looks a little squiggly. I tried my hardest to make it straight, but it always ended up distorted. The industrial looks fine for males though. There seems to be an issue where when your sim showers, the piercings revert to one of the standard maxis costume makeups, even when the category "naked" is activated. This seems to be an issue with a few other downloads on this site and I dont know if there's much I can do about it at the moment. These work for all outfits, teen through elder. The black lobe piercing you see on the male model is not part of the set -- it is a maxis accessory item and you all already have it. To clarify, the septum piercing is noted as "nose" in the file names. Models are my own. They are seen wearing Aikea Guinea's replacement skins and my custom replacement eyes. Girlie Tattoos - A set for your fem to live on the edge!